Slow growth remains the mantra of the Terry College’s economic outlook for the state of Georgia for 2012. Sumichrast delivered the 2012 forecast of the Selig Center for Economic Growth to an audience of Atlanta executives and government leaders attending the 29th annual Georgia Economic Outlook. He said the financial crisis and the bursting of the housing bubble dealt a blow to the state’s economic growth-more severe than in other states-and caused the steady influx of people and businesses migrating to Georgia to stop abruptly. That resulted in a “painful restructuring” of Georgia’s economy to move away from the state’s overdependence on real estate development to fuel growth. 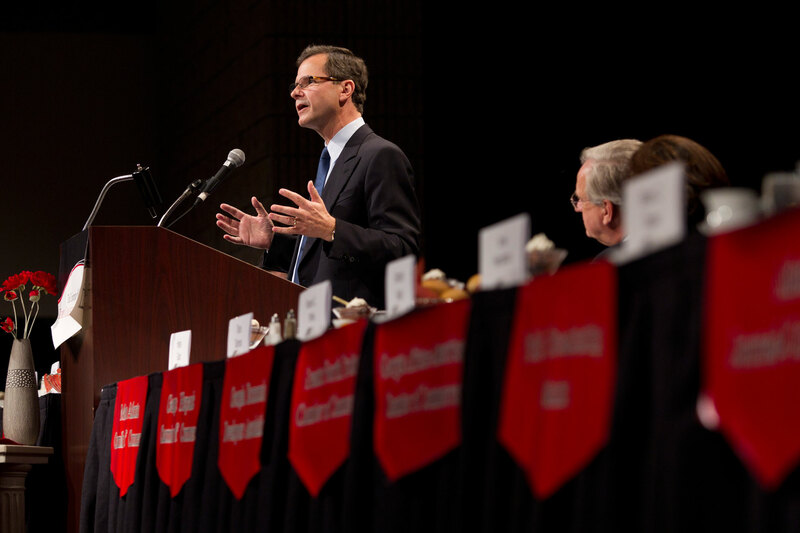 The somber forecast prompted Sumichrast to ask the audience to reconsider Georgia’s historical advantages and address the state’s new economic reality. • Economic development incentives. Though the pace of corporate relocation has slowed in the current climate, the state needs to become more aggressive with the incentives it offers companies to locate or expand in Georgia. Going forward, Georgia is unlikely to outperform the nation unless we change our economic development strategy,” he said.